Bruguiera gymnorhiza (black mangrove, Afrikaans: Swart-wortelboom, Xhosa: Isikhangati, Zulu: Isihlobane  is a small tree up to 10 m high that belongs to the family Rhizophoraceae. 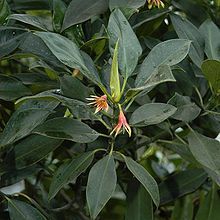 It is found on the seaward side of mangrove swamps, often in the company of Rhizophora. Its bark is rough and reddish brown. The tree develops short prop-roots rather than long stilt-roots. Flowers are creamy white soon turning brown. The sepals are persistent, narrow and slightly tapered. When mature, the spindle-shaped fruits drop and become embedded in the mud in an upright position, where they rapidly develop roots. The black mangrove is a protected tree in South Africa. In the Maldives this mangrove is known as kaṇḍū. The propagules or green pods are eaten as a cooked vegetable. They are peeled first and then boiled, the water being discarded and renewed at least four times. The propagules of this species are more appreciated than those of Bruguiera cylindrica. The green propagules are also eaten by many Indigenous groups in northern Australia. For example, on Cape York Peninsula Thaynakwithi people call the species nhomb and explain that the propagules could be baked, then mashed or pounded and the flesh placed into a sieve-like woven bag before being soaked in water . ^ a b "Protected Trees" (PDF). Department of Water Affairs and Forestry, Republic of South Africa. 3 May 2013. Archived from the original (PDF) on 2010-07-05. ^ Fletcher, Thancoupie (2007). Thanakupi's Guide to Language and Culture. Sydney: Jennifer Isaacs Arts and Publishing. p. 99. ISBN 9780980331202. "Bruguiera gymnorrhiza". Plantz Afrika. Retrieved 2010-09-19. Van Wyk, Braam; Van Wyk, Piet (1997). Field Guide to Trees of Southern Africa. Struik. ISBN 978-1-86825-922-9. This Malpighiales article is a stub. You can help Wikipedia by expanding it. This page was last edited on 26 March 2019, at 00:54 (UTC).